On October 10, 1517, the Augustinian monk Martin Luther (1483-1546) nailed his 95 theses to the door of the palace church in Wittenberg. Among other things, the theses attacked the brisk business in indulgences preached by the Dominican preacher Johann Tetzel (1465-1519), which was being grossly abused. In fact, the practice of granting the faithful a remission of punishment still due on forgiven sins in return for money was driven by financial motives. In particular, it contributed in large measure to the financing of the monumental reconstruction of St Peter's in Rome, begun in 1506, which was consuming vast sums of money. Luther's theses, which can be seen as marking the beginning of the Reformation, were highly controversial and in 1518 he was called on to defend them in a debate to be held in Augsburg. He refused to recant, and in the following year disputed the infallibility of the Pope and the Councils in a series of debates known as the Leipzig Disputations. In 1520 he published his criticisms in two treatises - To the Christian Nobles of the German Nation and Concerning the Babylonian Captivity of the Church in which he attacked the Papal hierarchy and questioned the validity of the seven sacraments. In On the Freedom of a Christian Being he elaborated his key doctrine of justification by faith: sinful man could not achieve salvation by his own effort and good works, but only by the grace of God, which could be granted to him only if he believed. Luther's doctrine, with the demand for a "reform of the Church in head and limb," was quickly and enthusiastically taken up. At first, Church and Emperor attempted to suppress it: in 1521 an imperial ban was pronounced on Luther and his followers at the Diet of Worms. It was now that the Elector Frederick the Wise of Saxony (elector 1486-1525) accorded Luther protection in Wartburg Castle, where the fugitive, now "Squire George," began translating the Bible into German. The Reformation spread quickly throughout Germany, boosted by the decision of the Emperor Charles V at the Diet of Speyer in 1526 to grant rulers freedom of belief. In 1532, the Emperor found himself forced to repeal the resolutions of the Diet of Worms in the Religious Peace of Nuremberg, as numerous princes and cities had converted to the Reformed faith. Before his death in 1546, Luther had formulated his unremitting criticism of the Papacy in a final work, Against the Papacy in Rome, Instigated by the Devil. Ten years later the separation of Protestant and Catholic churches was finally recognized in law in the Peace of Augsburg of 1555. Even in the first years of the Reformation, numerous groupings emerged. They differed markedly in the strength of their opposition to the Pope and in the thrust of their social and political demands, and even Luther could not unite them. There were also profound political differences. When the Reformer Thomas Müntzer (1490-1525) placed himself at the head of peasant insurgents in Thuringia, who, like similarly minded comrades in large parts of southern Germany, rose against their rulers in violent revolt during the Peasant War of 1524/25, Luther broke completely with Müntzer by utterly condemning the uprisings. In his theological battles, Luther also crossed swords with Erasmus, who, despite his criticism of the Papacy in the The Praise of Folly, came out against the Reformation. Highly individual positions were taken by the Zurich pastor Ulrich Zwingli (1484-1531), who in fact was influenced by Erasmus, and later, in Geneva, by Jean Calvin (1509-1564); both men had large followings in Switzerland. In the Marburg Religious Colloquy of 1529, it came to a personal clash between Luther and Zwingli over the interpretation of the Last Supper, and no agreement proved possible between the two reformers. In contrast, the humanistically educated Philipp Melanchthon (1497-1560), who taught Greek at the University of Wittenberg, supported Luther right from the first, and works by him such as the Augsburg Confession of 1530 helped create the basis of Lutheran doctrine. A central target for all reformers was the veneration of images customary in the Roman Catholic Church. For many reformers, it was not merely impossible to create an image of God (who by His very nature was beyond depiction), it was also blasphemous to try, as the biblical prohibition on "graven images" made clear. Moreover, there were often relics enclosed in sculptures called reliquaries, whose veneration the reformers likewise strongly rejected. Finally, another cause of hostility was the fact that the display of splendour in the colourful, often opulently gilded, painted, and carved images was not there to express God's glory, but to flaunt the wealth of the donor and his elevated social position. Criticism of this sort against pictures and their veneration had of course been voiced time and again ever since the earliest days of the Church. But the defenders of images had pointed out that in the person of Jesus, God had actually taken human form and could therefore be depicted. Furthermore; they argued, images served as books for the illiterate, and worship was directed not at the works of art created by human hand but only at the subjects they represented. Also, a theoretical distinction was made between the worship that should be offered only to God and the veneration that was accorded to an image. However, such arguments did nothing to encourage a more sympathetic attitude to images among the reformers, especially since for many of the populace the veneration of images of the saints had acquired a strong taint of superstition by the early 16th century. Erasmus himself had ironically observed in The Praise of Folly that people were "strange creatures who cling to superstitions that, though foolish, makes them happy. If they have been lucky enough to see a wooden statue or some other image of their Polyphemus, St Christopher, they believe they are safe from mortal danger on that day." In addition, material interests were often behind the veneration of cultic images. Pilgrimages to wonder-working images were often associated with indulgences, and so the places where they were kept attracted large numbers of pilgrims. As in modern centres of tourism, the economic benefit for the towns concerned was not to be underestimated. A famous example is the pilgrimage to the "Fair Virgin" in Regensburg, which Michael Ostendorfer (c. 1494-1559) depicted in a woodcut around 1520. Just a few months before the erection of a temporary pilgrimage church, a synagogue on the same spot had been destroyed and the Jews driven out of the city. During the demolition work, a worker is supposed to have survived a serious fall. This miracle was ascribed to the "Fair Virgin" - an act of intervention that was also interpreted as a sign that the Mother of God approved of the action against the Jews. 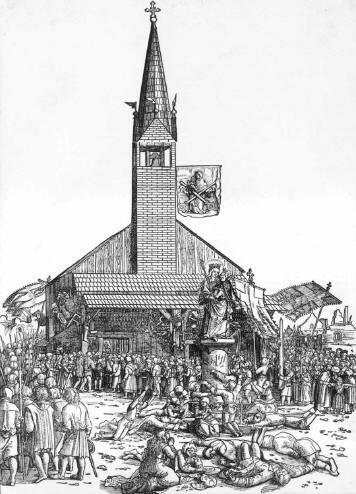 Shortly after, the Pope granted indulgences for the pilgrimage, and as a result pilgrims flocked to Regensburg. Out of previous economic stagnation, the city rapidly prospered. The reformers, however, denounced the veneration and commercialisation of the "Fair Virgin." Dürer, who owned a copy of Ostendorfer's woodcut, was among those who were highly critical, noting on the sheet: "This spectre has arisen against the Holy Scriptures in Regensburg and is allowed by the Bishop because it is expedient at the moment. God help us not to desecrate the reverends Mother of Christ in this way, but to honour her in His name." Though the reformers were united in their criticism of images of saints, they nonetheless differed in their opinions of how to treat the existing works that filled the churches. Whereas Luther treated the removal of the images with relatively little passion, and would probably have removed them from the churches without any fuss, his colleague, the theologian Andreas Bodenstein von Karlstadt (c. 1480-1541), adopted a far more radical stance. After the municipal authorities of the town of Wittenberg had issued an "Order of the town of Wittenberg" dated January 24, 1522, demanding the removal of pictures from the churches, only three days later Karlstadt issued a tract concerning the "doing away of the pictures." In it he complains that, a full three days after the edict, the works of art had still not been removed. This led to the first Iconoclastic Riot at the beginning of February in the city church of Wittenberg, where the "idols in paint" were torn down by Karlstadt and his supporters. Luther reacted to such crude incursions with an even more moderate attitude towards art works; more important than removing them would be to develop a new relationship with them based on the new doctrines. Unlawful acts were not called for. The Iconoclastic Riot in Wittenberg was followed by many similar attacks on art works in other places, notably in Zurich in September 1523. There the reformer Leo Jud (1482-1542) had preached the removal of idols, after which altar paintings, crucifixes, and statues of saints were smashed and holy water mocked. Although Zwingli agreed with the removal of the images, he spoke out against using any kind of force. He recommended covering the sculptures in the churches and closing the winged altars, as was done anyway during Lent. Thus, the more elaborate insides of the altarpieces that were causing offence would be hidden from view. Zwingli also declared that the pictures should not be subjected to mockery. In accordance with these principles, he demanded that the iconoclasts should be punished. In Zurich in October 1523, the Sacrifice of the Mass was abolished and the removal of the images agreed. Subsequently, all works of art and relics in Zurich were removed from the churches in an orderly manner. In later days, Zwingli tolerated artistic representations, as long as they were not venerated but read as narratives. Among the reformers, it was Calvin who adopted the most radical attitude towards religious works and demanded that believers should make no images of any sort of God. The iconoclasts who viciously wrecked art works throughout the northern Netherlands in 1566 and "cleansed" churches from top to bottom justified their actions by reference to Calvin's doctrine. This act of devastation explains why so few paintings from before 1566 have survived in Holland.